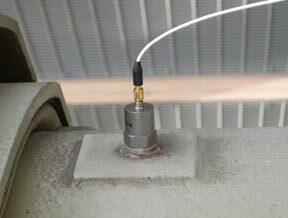 Our specialty is finding solutions to vibration problems at our customers’ locations. There are no travel limitations; most of our equipment is portable and battery powered to operate in the most remote locations. We use state-of-the-art instruments, such as FFT spectrum analyzers. Experience with many classes of machines and knowledge acquired with on-site vibration analysis and consultation results in a prompt solution to vibration problems. Machine Dynamics is geared to root-cause analysis in the most professional manner. We can periodically survey your equipment for developing mechanical problems. With a digital signal analyzer we can check the balance condition, bearings, alignment, wear, looseness, structural defects, flow conditions, and some motor electrical problems. Typical monitoring intervals are monthly, quarterly, semi-annual, and even annual surveys. You specify the equipment to be monitored and the interval. Cost is typically $25.00 per machine at each interval. We would be glad to provide a free quotation after a walk through of your facility. We specify wall and floor construction to minimize air-borne and structure-borne noise transmission into sensitive spaces such as classrooms, multi-unit dwellings, offices, music rooms, recording studios, and theaters. We specify surface treatments and recommend room dimensions and shapes to control the quality of sound propagation in enclosed spaces. Any type of occupied space can benefit from good acoustics. Problems such as poor speech intelligibility, excessive occupant noise, and poor speech privacy are among the issues that can be corrected with proper selection and placement of sound absorbing materials. Furthermore, good sound diffusion and propagation in lecture halls, theaters, classrooms, and music rooms will result from appropriately placed reflective materials. We specify sound attenuators, maximum air velocities, isolation of ducts, pipes, and equipment in order to meet appropriate levels of background noise and vibration in occupied spaces. We also provide consultation in space planning for HVAC equipment. Field Sound Transmission Class (F-STC), Apparent Sound Transmission Class (A-STC), and Noise Isolation Class (NIC) are among the ratings that can be measured for installed wall partitions and floor/ceiling assemblies. The F-STC rating most closely compares to the laboratory rating of Sound Transmission Class (STC). The A-STC rating includes the effect of flanking paths, such as open-plenum ceilings, doorways, etc. The NIC rating represents the raw sound level drop across the partition, and does not make the corrections for the measurement environment that the F-STC and A-STC ratings do. We perform all of the above tests according to the most recent ASTM standards E336 and E413. Field Impact Insulation Class (F-IIC) rates the effect of footfall noise, and is performed with the use of a standardized tapping machine that conforms to ISO standard 140/6. The tapping machine is placed on the floor of a floor/ceiling assembly while the sound levels are measured in the space below. Corrections are made for the room acoustics in order to achieve a result that closely compares with the laboratory rating of Impact Insulation Class (IIC). We perform this test according to the most recent ASTM standards E1007 and E989. This is the measurement of the time for sound to decay 60 dB. Reverberation time is directly related to the sound absorption present in a space, and is utilized when improving room acoustics and background noise levels. Using integrating/averaging instruments, we measure background HVAC-related noise levels, environmental noise levels, and report several metrics, including the commonly specified Noise Criteria (NC), Room Criteria (RC), and dBA. This tutorial serves as an introduction to our training program, and introduces anyone to the techniques, tools, and benefits of vibration analysis.